Bikes are the mostly efficient ad eco friendly way of taking us from A to B but this bike can offer even more. Its an eco-friendly bicycle that cleans polluted air while cruising down the street. 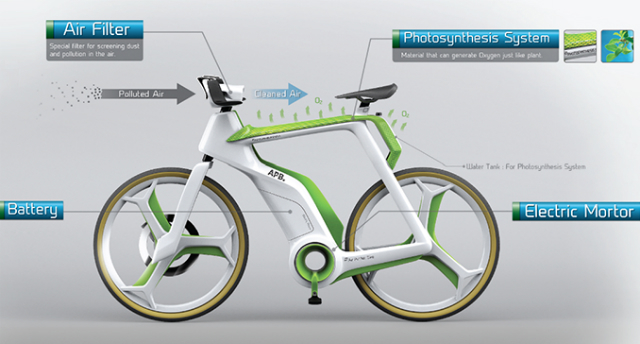 The air-purifier bike designed by Bangkok's Lightfog Creative & Design Company currently exists only in concept . In theory, its aluminum frame would run on a "photosynthesis system" that generates oxygen through a reaction between water and electric power from a lithium-ion battery. We want to design products which can reduce the air pollution in the city. So we decided to design a bike because we thought that bicycles are environmentally friendly vehicles for transportation - creative director Silawat Virakul. "Riding a bicycle can reduce traffic jams in a city. Moreover, we wanted to add more value to a bicycle by adding its ability to reduce the pollution," Virakul said. No prototype of the bike has been developed so far and how the air purifier bike would work is yet to be determined .